There are always a few "it boys" in current American playwriting, and right now, the eccentric and poetic Will Eno definitely hits the list. Eno emerged onto the national theatre scene with Thom Pain (based on nothing), a one-man show that enjoyed a sold-out run at the 2004 International Edinburgh Festival, where it won the First Fringe Award, among others, and then took New York by storm with a year of off-Broadway performances. Thom Paine was also a finalist for the 2005 Pulitzer Prize for Drama. The Flu Season received the 2004 Oppenheimer Award for the best debut production in New York by an American playwright, and his newest work, Gnit, an updated and irreverent adaptation of Henrik Ibsen's Peer Gynt, was a mainstage selection for the recent Humana Festival at the Actors Theatre of Louisville, in a production directed by Actors Theatre Artistic Director Les Waters. It helps that Eno's writing is singular and different, with its own rhythms and warped sense of humor. Middletown, the deceptively sweet play about life in Anytown USA that preceded Gnit, received the Horton Foote Prize for Promising New American Play in 2010. 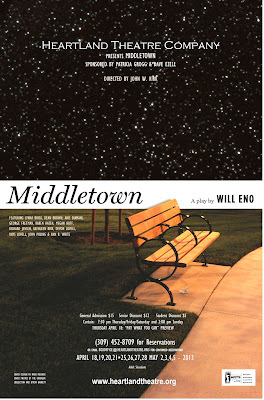 It has that Eno touch, making it sound and feel distinctly different from Thornton Wilder's Our Town, for example, a play Middletown has been widely compared to. Both plays deal with ordinary people living ordinary lives in an ordinary town, and both touch on life and death. But while Our Town shows us life and death, Middletown is more about the time and space in between, about the middle, about regular old people finding a way to mind that gap. John Kirk, who is directing Middletown for Heartland Theatre, writes that Eno's characters "are trapped in 'the space between' their birth and their death. The title Middletown...suggests the dilemma of characters who are stuck in the middle of themselves and have not found a way out." The characters in the play range from John Dodge, a handyman type who is between jobs but has lived in Middletown for a while, and Mary Swanson, who just moved there with her husband to start a family, to a cop, a librarian, a mechanic, doctors, and even a couple of tourists who come to see what this town is all about. For Heartland, Rhys Lovell will play John, and Karen Hazen will play Mary, with Lynna Briggs, Dean Brown, Aric Diamani, George Freeman, Megan Huff, Richard Jensen, Kathleen Kirk, Devon Lovell, John Poling and Ann White filling out all the other roles in the everyday tableau that is Middletown. Performances begin tomorrow night with a special Pay What You Can preview at 7:30 pm, with shows continuing Thursdays through Sundays till May 5. For details on times and dates of performances, click here. To see reservation information, click here.